The Menu: Some items vary depending on who’s hosting the party, but certain things will always be there. Lechón (pork), usually left with the skin, is a favorite of all. 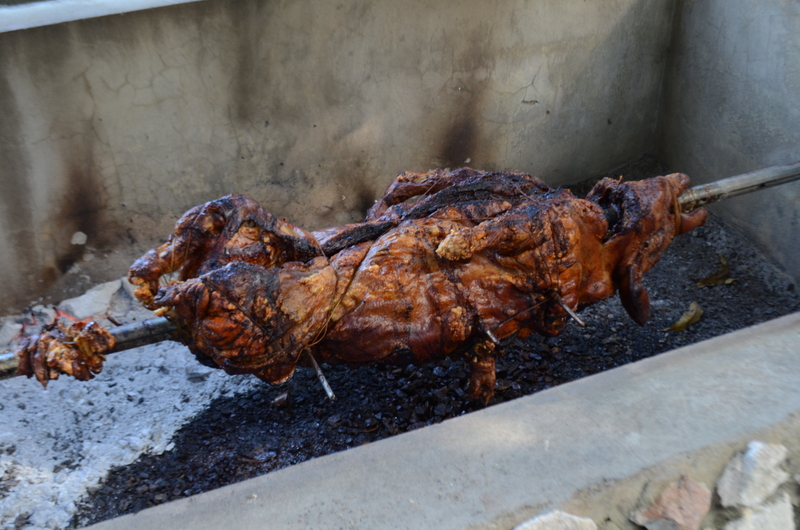 A traditional way of preparing it is to roast the entire pork “a la vara” in a pit occasionally turning it. Arroz con Gadules (rice with pigeon peas). Of course pork must be combined with arroz con gadules! Pasteles: This is a typical dish made with plantain or yuca batter and stuffed with pork or chicken and wrapped in plátano leaves (plantain leaves), then boiled. It’s not officially the christmas season until you eat one. Morcillas. This plate is peculiar… there’s some rice in there with spices. It kinda looks like a dark sausage. Just try it! Pitorro, the old-time favorite that just keeps getting better. Pitorro is home-made spiced rum, cured over time. You’ll find large bottles like in the picture filled with colored liquid and chunks of various fruits. As traditions grow, people keep getting more creative with the recipes: pear, passion fruit, tamarind, coconut and pineapple, coconut and almond, papaya, etc. It’s really strong, but washes down warm and you sip it (at least I do). 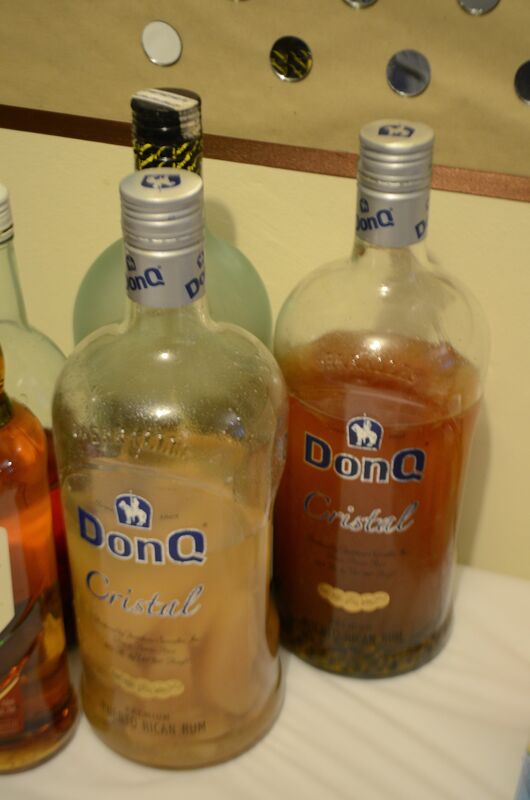 Coquito: An eggnog like drink made with rum, coconut milk, condensed milk and other spices. It’s served cold, and it’s sweet and delicious, although usually strong so they serve it in a shot glass. Panderos, palitos, amd a güiro. The Music: Although some houses will have music playing from a speaker, at some point live music simply happens. 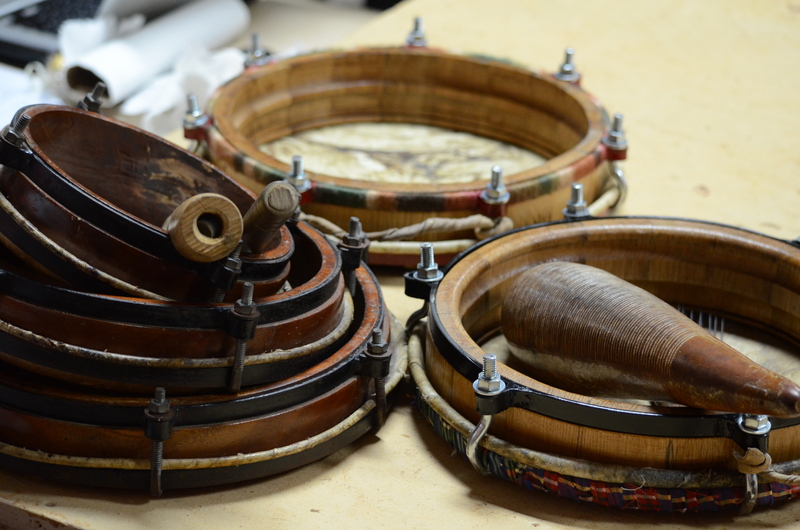 Whether a parranda arrives (a group of people singing with guitars, güiros, maracas, and anything that makes noise. It’s a loud, merry version of caroling… boricua style), pleneros (group of people playing panderos and singing Plena), or simply someone grabs an instrument and everyone starts singing, sooner or later it’s bound to happen. Pyrotechnics: When the clock strikes midnight it’s essential to make a lot of noise. Firecrackers and cherry bombs used to dominate, but ever since fireworks became mainstream this is one tradition that, like the Pitorro, keeps getting more elaborate. The skies alight with sparkles of different colors and everybody cheers: ¡Felicidades! The party continues well into the night… or morning, if the neighbors don’t mind, and you can bet you’ll be eating left overs on Jan 1st. No worries, those are the kind of leftovers that make it a very Happy New Year!